Make a successful transition to a Paleo Diet in just one month. 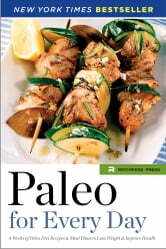 The Paleo Diet is a lifestyle change that can revolutionize your health. On a Paleo Diet, you will look and feel better than ever before, just by avoiding the modern-day processed foods that make us overweight and unhealthy, and consuming nutritious, wholesome foods instead. Paleo for Every Day will guide you through the first four weeks of the Paleo Diet, with dozens of delicious recipes and easy-to-follow meal plans that will help you lose weight, build lean muscle, and prevent disease. The Paleo for Every Day is a step-by-step guide to achieving sustainable weight loss, a lean body, and better health with the Paleo Diet.